I have both collected and sold Lincolniana, and I have been an Authenticator of questioned Lincoln documents and photographs (see for example chapters 4 and 9 of my Real or Fake). I have also addressed other Lincoln mysteries such as his authorship of the Bixby letter (Unsolved History, 2005, 90-105), and his connection with the paranormal (Real-Life X-Files, 2001, 109-117), including his alleged spirit writing (Adventures in Paranormal Investigation, 2007, 39-47). 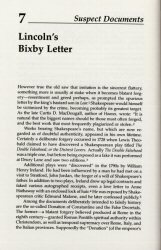 My work has been referenced in Lincoln Legacy (see David Warren, 1990-91, "Has Lincoln's Final Draft of Gettysburg Address Been Found?" 4: 3-4 [fall 1990, winter 1991]: 1-18), and other journals. I was also a Publisher's Reader for Lincoln Legends by Edward Steers Jr. (Univ. Press of Kentucky, 2007).